Although this was a short trip and the team was small we saw more people here than during other missions. We were in Burundi for 7 days and carried out clinics every day we were there. Security was an issue and we were advised not work in any one area for too long. We tested in four villages; Myebe and Rugazi near Bubanza, Kyramira near Cibitoke and Nyshenza. 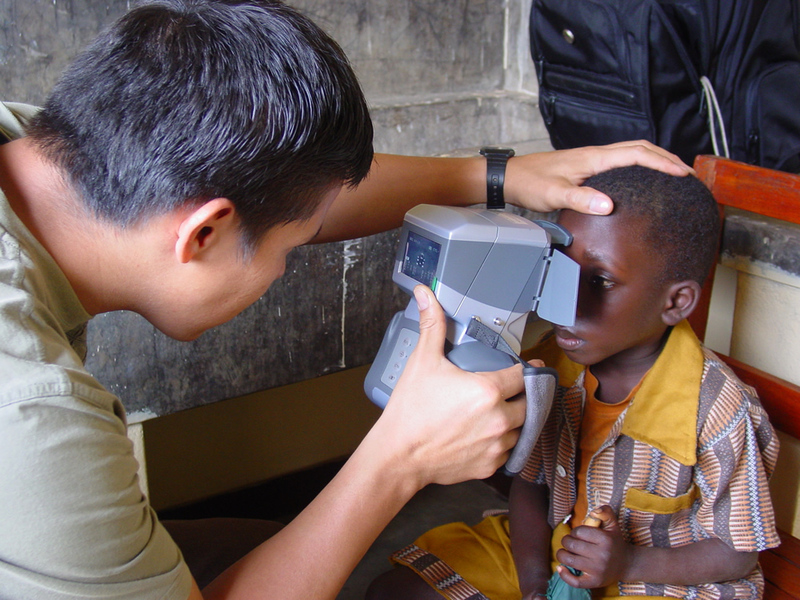 The team comprised of just one optometrist who joined us from South Africa, two dispensers, and three screeners. We arrived Sunday afternoon and stayed in the Saga Plage Hotel on the shores of Lake Tanganyika. The following day we visited the Belgian embassy to make enquiries regarding security in the area we were visiting. There had been some recent incidents close to the clinic sites we were due to go to. We were slightly reassured by the head of security that it would be safe, providing we did not travel at night and that we didn’t stay in one place too long. We arrived at our base for the next three days in Bubanza and, after offloading the vehicles, we started our journey to the first clinic location at Muyebe. We had been given a small medical clinic to work in and were rather overwhelmed when we were welcomed by nearly 3,000 people. There were just 6 people in our team with only one optometrist. It was bedlam initially but we managed to get set up and started registration. We worked for two days in Muyebe and then did one day in Rugazi, which was about an hour’s drive from Bubanza. The second half of the mission took place in Cibitoke district, where we spent 2 days in Kira Myra and a day further north. Again there were huge crowds; amazingly very few required distance correction but we gave out hundreds of reading glasses. The team did really well considering the number of people that were seeking our help, and over the 6 days of testing we dispensed 1400 pairs of glasses and registered nearly 200 for cataract surgery. Over half of these were paid for by Mission for Vision. We also gave out just short of 600 pairs of sunglasses. Many thanks to the team members, Brigitta, Kath, Marco, Graeme, and Derek. Also the Burundian team, headed up by Bienvenu and Emmanuel, who put the medical team together. Throughout the mission we preached the gospel, proclaiming that if people would turn from their sins and put their faith in Jesus they would be saved. It was such a blessing and a privilege to baptize 19 people in a stream on our last day in Burundi. It was a great witness to the local community and many rededicated their lives to the Lord. We give thanks to the Lord for keeping the team safe and providing all our needs to fulfil the mission.